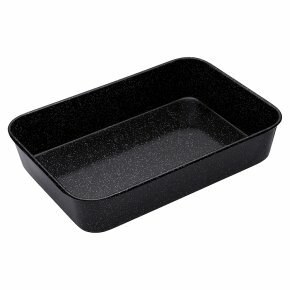 A versatile pan ideal for roasting meat, vegetables or for making gravy on the hob. Manufactured from heavy duty 1mm steel, with a highly durable enamel coating, this baking tray forms part of the Master Class award winning bakeware collection. Able to be used with metal utensils this pan is suitable for all direct heat sources including induction. Dishwasher, oven, fridge and freezer safe. 25 year Guarantee.